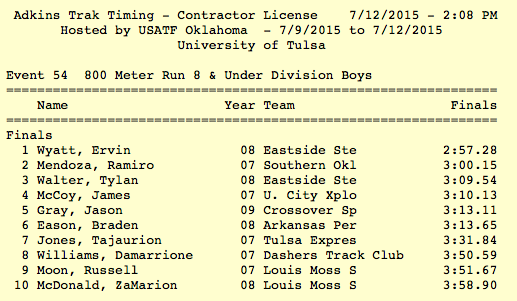 What an exciting weekend it was for Braden as he competed against the best runners from Arkansas, Oklahoma, Kansas, and Missouri at the USATF Region 9 Junior Olympic Championships in Tulsa, OK on July 11! Three weeks earlier Braden qualified for Regionals in the 400, 800, and 1500M events, but the 400 is more of a sprinting event, which is not his strength, so I signed him up for just the 800 and 1500. In his qualifying races in Little Rock he ran a 3:39 in the 800 and a 7:08 in the 1500, by far his worst times he had run, but he had already run a race that morning and it was very hot and windy at the meet, which contributed to the slower times. The one advantage he had in Tulsa that he didn't have in Little Rock was the time between in events. He had very short turnaround times between races in Little Rock and you could tell it took a toll on him. For Regionals, though, he had a 9 hour break between his 1500M race, which began at 8 a.m., and his 800M race which started at 5 p.m.
Braden had almost perfect conditions, considering it was July in Oklahoma, for the 1500M race. It was in the mid-70's and winds were around 8 mph. The only instructions I gave to him was to make sure to at least keep the second place kid in front of him. I underestimated him! Braden started out kinda slow, but after the first lap he pulled into second place. From there he fell behind quite a bit from the first place runner, but he in his own right had developed a big gap between himself and the third place runner. At that point I was nervous that he was pushing his pace too fast, but he maintained his advantage through 1200 meters. On the final backstretch the third place kid started to up his pace, but Braden was too far ahead and poured it on the final 100 meters. I honestly could not believe that he finished second...not only that, but at the time he generated. He came in at a time of 6:31.77 which beat his previous best from Little Rock by 37 seconds and it was far and away the best time he had ever ran for that distance! With that, he received a silver medal and qualified for Nationals in Florida later on this month!! Unfortunately, we made the decision this year to not go to Nationals because of the timing and expense of the trip, but he knows that next year, when he is 8 years old, his times will be even better and we will send him to Nationals where he'll be able to be more competitive. After the 1500, we had a good plan in place that allowed him to relax between the events and not be in the heat all day long. We headed back to the hotel, ate lunch, went to the theater to watch a movie, and then went back to the hotel to take a nap before going back to the track. Braden felt refreshed as he prepared for the 800M event, which was good because the temperature had risen to the low-90's and the winds were close to 12 mph. Braden had a great start to the race and by the end of the first lap was in fourth place, but on the backstretch on the final lap he was overtaken and was sitting in sixth. On the final curve he battled back to get even with the two that passed him. One of the kids really kicked it into gear to pull ahead by 3 seconds, which left Braden to fight with the other for the 5th place spot. In this Regional, the top 5 finishers qualify for Nationals, so Braden was gunning for the last spot. At the last 25 meters Braden edged slightly ahead, but couldn't maintain the lead and got edged out at the finish line by a 1/2 second. He finished in 6th place, but I couldn't be more proud of a 6th place finish! His time was 3:13.65, which was 26 seconds better than Little Rock, and once again was the best time he had run at that particular distance! This is when things got interesting and introduced me to the politics of track...in a bad way. After his race, I went to get him to congratulate him on his new personal best, knowing he didn't qualify for Nationals. On the way, I saw his coach and told him that he came close to getting top 5. At that point he told me that one of the officials had raised a red flag and disqualified one of the runners...who happened to come in 1st place...and who happened to be from Oklahoma...and whose track club was well represented at the meet. At the beginning of an 800M race, all the runners have to stay in their respective lanes until the 100 meter mark, where they then are allowed to converge to the inner lanes. The race officials told the kids that at the point of the orange cones, that is where they could move over. Apparently, though, the first place finisher started to converge about six yards before the cones and was the reason why the red flag was raised. I know that if it were my kid, I would be sickened by the thought of coming in first and getting disqualified, but in the same respect rules are rules and even though Braden wasn't going to go to Nationals, he would have won a medal and still had the distinction of qualifying. 30 minutes after the completion of the race, I went to go get Braden's medal and was told that he didn't get one because he finished in 6th. I told the lady that the first place finisher had been disqualified, but she said it wasn't reflecting on the official results. At that point I told the coach what was going on and him and I went to track down the race officials to find out was going on. It took over an HOUR for these officials from Oklahoma to confer with the other coach, amongst themselves, and then the guy who raised the red flag. They finally got back to our coach and gave a lame excuse that in the flag guy's judgement he thought it was a different kid who made the violation. I then challenged her by saying if that were the case, SOMEONE would have been disqualified and from the results, yet no one was. She then came back with some other lame excuses and the coach basically called her on the carpet and accused them of protecting one of their Oklahoma runners and that they were creating a cheating environment. I was then told I could protest the decision, but I'd have to pony up $100 and because it was a judgement call from the flag official, we would basically lose. 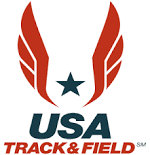 From there, the coach told them that he expected more from a USATF Regional event and that what they were doing was crooked, but unfortunately there was nothing we could do. As we were leaving the stadium, I had to tell Braden that once again he was in 6th and wasn't going to get a medal. Credit to him for not throwing a fit or crying about it, but I could tell he was disappointed. The coach then took him aside and told him that he was his star athlete for the meet and couldn't wait till next year when Braden would be another year older and in the same age group because he thinks that he'll be competing for 1st place finishes, especially if he keeps working on his speed. After saying these kind words, he told Braden to wait as he went to the back of his vehicle to search for something. When he came out, he gave Braden a medal and told him that he deserved another one after the exceptional meet that he had. What a class act!!! Even though the outdoor track and field part of the Junior Olympics is over for Braden this year, he will now start training for the Junior Olympic Cross Country National Championships that will be held at Albuquerque, NM in December. 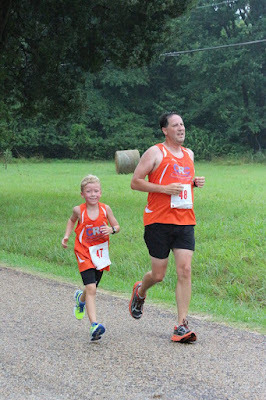 We told Braden that once he qualifies in November here in Arkansas, we would take him to Albuquerque to run with more than 200 other runners in his age group. Until then, he will be running a few more 5 and 10K Grand Prix events. 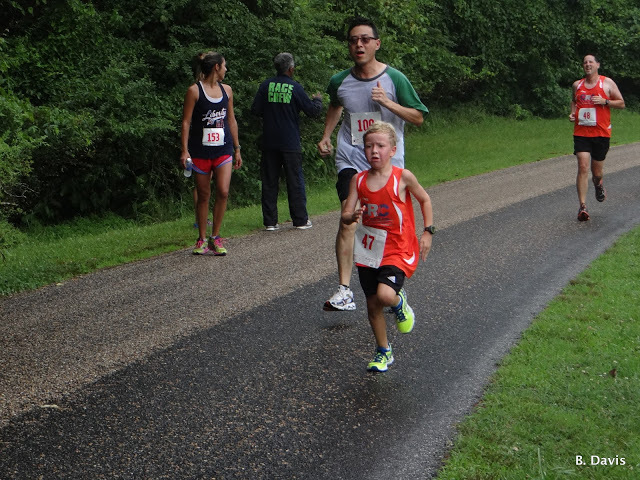 He is going to miss his first Grand Prix race (the White River 4 Miler) since March because he will be vacationing in Minnesota with his grandparents, but will be back for the Watermelon 5K at Hope, AR on August 8. 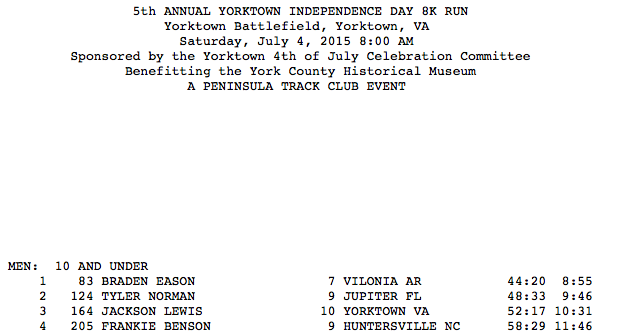 For the 4th of July holiday, our family took a two-week vacation to Williamsburg, Virginia where we experienced historical sight seeing, amusement parks, days at the beach, and to top it off...an 8K run at the Yorktown Battlefield Park. When I go out of state, I usually like to schedule a race for fun and this time I wanted to schedule one that would be on the 4th and coincidentally would also be Braden's first race outside of Arkansas. While in Virginia, I wanted to do some training runs in preparation for the race. One morning I was going to take a 5K easy run with my father-in-law around the William & Mary University campus and it ended up being an 8-mile run due to getting turned around and lost. Luckily Braden, who was supposed to go with us, decided he didn't want to run that morning or he would've been hating it! A few days later, we did go on a 5-mile run through a park that consisted of a lot of trails; which was a first for Braden. There he found a new love...trail running. He was having the time of his life running through the woods and is now wanting to run a trail race. Other than that, most of our training included long and tiring days on foot in Washington D.C. and at the Kings Dominion and Busch Gardens theme parks. Prior to the race, I was not only concerned about the 8 a.m. start time, but the Virginia heat as well because it could be just as bad as Arkansas, except with more humidity. Luckily, the temperatures were in the mid-70's at the start and the sun stayed behind the clouds, but boy was it humid! It had rained the night before and most of the course was under a forest canopy, which to me felt like it trapped in the humidity. I was very thankful when they said there would be water stops every 1.25 miles. The start and finish line area was adjacent to aptly named Surrender Field at the Yorktown Battlefield, where the British surrendered to the Americans & French to effectively end the American Revolution. It was a very pretty course and one of my thoughts was that it would be absolutely beautiful in the fall...especially with the lower temps. When we kicked off the race we were aggressive getting out since we were fighting with almost 300 other runners on the paved trail. At one point Braden said that we were going at a pretty fast pace, but my Garmin was telling me otherwise. It was telling me we were at a 9:55 pace, but I was almost in agreement with him that it seemed we were going faster than that. When we reached the 1 mile marker, a lady next to us was saying that they were at an 8:55 pace, but I was still showing around 9:45. I then looked again and noticed my watch was showing we had also ran only 3/4 of a mile instead of 1. I don't know if it was the canopy or what, but somehow we "lost" a 1/4 of a mile. So, the rest of the race we couldn't rely on pace to gauge on how we were doing and we were getting drenched from the humidity. There were a couple of times I stopped to let him to catch up to me, especially after some hills, but with a mile to go he started to kick it into a higher gear. We passed a lot of people the last mile, and because it wasn't chip timed, the race officials asked that we enter the finish gate in single file so they could grab the bottom of our bib to annotate the time. About a 100 yards out, Braden started his finishing kick and I told him to catch the next person, which he did, and he finished with a time of 44:20 and I finished 4 seconds behind him. It was a minute off his previous best at the Rock Run 8K, but he finished in first place in his age group and the other runners were very complimentary to him afterwards. It was a great way to end our vacation and now his next set of races will be in Tulsa, Oklahoma on July 11 for the USATF Region 9 Junior Olympic Track & Field Championships. There he will run the 1500 and 800M events against some very tough competition from Missouri, Oklahoma, and Kansas.